All Indie Magazine: What does Hard Rock Cafe, Celebrities, New York State Senate, and St. Jude Children's Research Hospital have in Common? 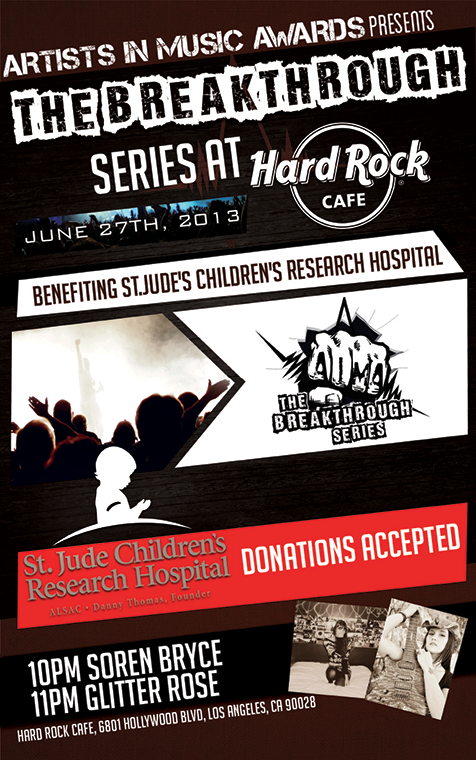 What does Hard Rock Cafe, Celebrities, New York State Senate, and St. Jude Children's Research Hospital have in Common? THE ARTISTS IN MUSIC AWARDS - THE BREAKTHROUGH SERIES, THAT'S WHAT! Guess what? 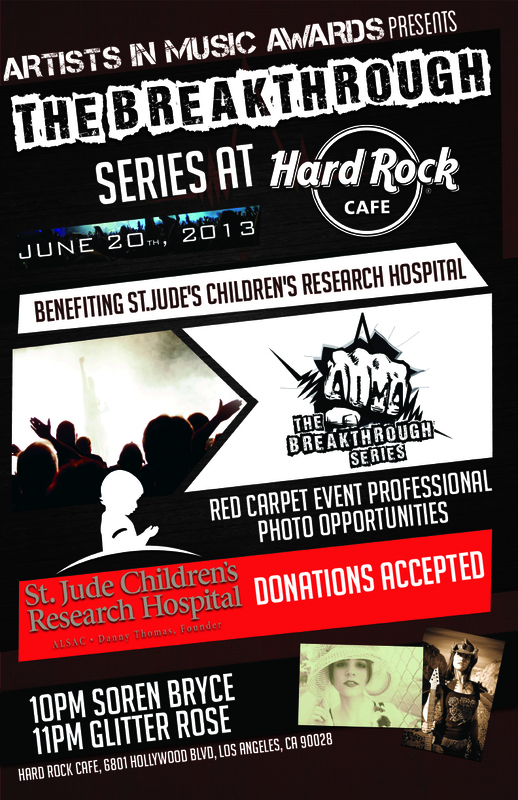 It’s May and we’re just a few weeks away from the premiere of “The Breakthrough Series” at Hard Rock Café in Hollywood, CA on June 27, 2013 beginning at 10pm. This will be the first event of the series to officially kick off the 2014 Artists In Music Awards! One, we’re helping out a charitable cause by donating to St. Jude Children’s Research Hospital. Two, we have some spectacular performers that evening including 2013 Artists In Music Awards winner for Best Folk/Acoustic Artist, Soren Bryce and Best Rock Artist and Best Album of the Year winner, Glitter Rose. Three, some big celebrities will be in attendance. We’re not at allowed to publicly say who is coming, but you should definitely come and find out! Four, this is going to be a fantastic photo opportunity on the Red Carpet. You may even get interviewed by inDspotlightTV and by other members of the media. A SURPRISING ACCOLADE FROM A NEW YORK SENATOR! 2013 AIMA winner for Best Electronica Artist and Producer of the Year, Avery Berman of The Ground Above received a nice public notice from a government official. “…[T]his Legislative Body is justly proud to congratulate Avery Berman of New Paltz, New York, upon the occasion of his designation as recipient of two prestigious Artists in Music Awards” - New York State Senator, John J. Bonacic (R, C, IP) 42nd Senate District. Once again, congratulations to The Ground Above for receiving 2 awards! We couldn’t be more proud of him. Earlier this year, we partnered with Arts Seen & Heard PR and they graciously donated a $5,000 grand prize to the Artist of the Year winner. We’ve also established a new partnership with MusicSUBMIT and we are proud to announce the return of 101Distribution and Independent Music Promotions. We are also very proud to announce our partnership with St. Jude Children’s Hospital. They are the official charity of the 2014 Artists In Music Awards. We would also like to thank Spirit Airlines, Advantage Distribution, and of course KGUP 106.5FM “The Emerge Radio Networks”, the official radio station of the Artists In Music Awards.